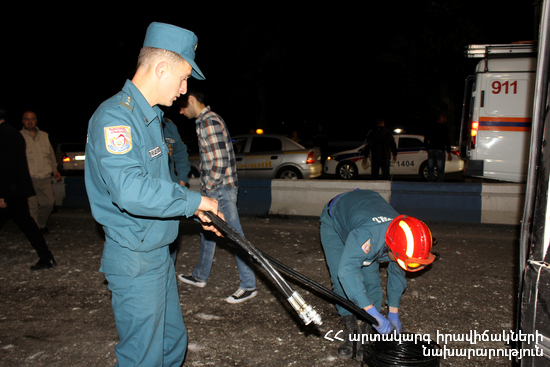 On February 8, at 00:31 an emergency call was received to “911” service that a car accident has occurred near the bridge of Dimitrov village on Yerevan-Yeraskh highway: there were casualties. The rescuers’ help was needed. It turned out that “GAZ-24” and “Toyota HiAce” cars has collided on the 23rd km of Yerevan-Yeraskh highway. As a result of the collision “Toyota HiAce” had crashed into a metal divider of the roadway. The driver of “GAZ-24” died on the spot. Before the rescuers arrived at the scene the driver and a passenger of “Toyota HiAce” had been hospitalized to the medical center of Artashat town. Then the casualties were taken to “Erebouni” medical center where receiving necessary medical aid were discharged. The rescuers disconnected the automotive batteries of the cars, closed the gas valve of “GAZ-24”, approached the cars to the tow truck and took cleaning up actions of the roadway.